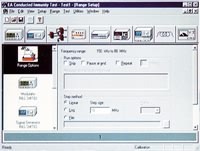 Designed in-house by our team of software engineers, our software packages feature a familiar Windows ® based graphical interface that makes it easy to use without sacrificing flexibility or performance. TDK RF Solutions test software supports full automation for a variety of EMI and EMS tests specified in North American, European, and Asian regulations. This allows you to create a fully automated system that practically runs itself. Semi-automated and manual control are also supported, if you prefer to interact with the test process every step of the way. TDK RF Solutions test programs are modular in design and flexible enough to allow for revisions to measurement regulations and to extend hardware functionality to incorporate new test requirements. TDK GTEM Emissions Lab makes it simple to perform radiated emissions tests in a GTEM. Designed by experienced EMC engineers, TDK GTEM Emissions Lab is easy to use without sacrificing performance. You can create an uncomplicated system for others that practically runs itself, or you can interact with the test process every step of the way. For example, for radiated EMI tests in a GTEM, you can choose up to 12 EUT positions at which the software will make measurements. A GTEM to OATS correlation utility computes the E-field. User-defined limits, cable loss, and preamplifier factors are all taken into account by the software. Performance TDK RF Solutions’ Standard Emissions Test Software makes it simple to perform radiated and conducted emissions measurements in shielded rooms and at open area test sites (OATS). Designed by experienced EMC engineers for testing to CISPR, VDE and FCC regulations, TDK RF Solutions’ Standard Emissions Test Software is easy to use without sacrificing high-end performance. Automated or Manual Control TDK RF Solutions' Standard Emissions Test Software enable you to create an uncomplicated system for others that practically runs itself, or if you are a "hands-on" person, you can interact with the test process every step of the way. Ease of Use TDK RF Solutions’ Conducted Immunity Test software is specifically designed to simplify complex conducted immunity tests and bulk current injection (BCI) tests. The familiar graphical interface makes it easy to use without sacrificing flexibility or performance. Flexibility You can create an uncomplicated automated system for others that practically runs itself, or if you are a hands-on person, you can interact with the test process every step of the way. Performance Test your product for immunity to conducted disturbances on its power, signal, or control lines, or test to determine your product’s immunity to complex waveforms of induced bulk cable current. Performance TDK RF Solutions’ Radiated Immunity Test Software is designed to automate radiated immunity testing by controlling the signal source output levels and monitoring the power levels necessary to generate the required field levels over a set of frequencies. It supports Substitution, Closed Loop, and Theoretical testing methods. Ease of Use TDK RF Solutions Radiated Immunity Test Software makes it simple to perform radiated immunity tests in an anechoic chamber. Designed by experienced EMC engineers, TDK RF Solutions Radiated Immunity Test Software is easy to use without sacrificing performance. Flexibility You can create an uncomplicated automated system for others that practically runs itself, or if you are a "hands-on" person, you can interact with the test process every step of the way. 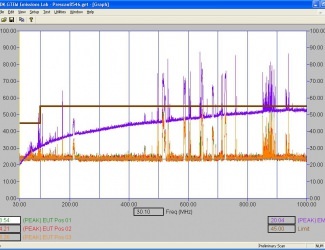 Versatility TDK RF Solutions’ EUT Monitoring Software allows you to acquire data from an EUT via an oscilloscope, a receiver, a spectrum analyzer, a status monitor, or a dynamic signal analyzer. The software can determine the pass/fail status of the EUT by comparing the acquired data against pass/fail thresholds. Portability Data acquired by the EUT Monitoring software can easily be transferred to other TDK RF Solutions software applications. This information can be displayed in data tables and graphs along with other test data, giving you access to all test data in one place. This makes it easy to see what the EUT data values were at each test frequency.